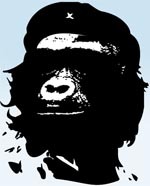 This started as “The Storage Guerilla”, but as that sounded pretentious (and due to the author’s resemblance to said banana-chomping simian) “The Storage Gorilla” seemed like a better choice – same sound, different take on the world. But really, who else here feels like the technology world is like Guerilla Warfare? The Gorilla is a consultant specialising in storage design and implementation planning. Having given up a career in aircraft engineering, he began his IT life at Accenture by being told that he had to fix something called a “san” for a major supermarket chain. After a quick trip to borders books he discovered that a san was actually a SAN (and not something to do with a broken toilet as he’d initially thought). One crash-course in fibre (fiber?) optics later, he began a career in the storage industry that has so far lasted over 10 years. After a time with Accenture that saw him act as one of the founder members of Information Solutions Consulting (now EMC Consulting) and then working for a small consultancy firm in the city of London, the Gorilla has fetched up at his present position, architecting storage solutions for a large UK-based reseller. As part of this work he is in the fortunate position of seeing some of the more interesting storage technologies (usually long before they are interesting to anyone else but him – he’s hellish at dinner parties).